Of course, if you’ve pushed on to Balloch the day before then it’s a whole lot shorter! The A82 can be busy but if you’re doing this day in the week it can be quieter (but don’t quote me on that). 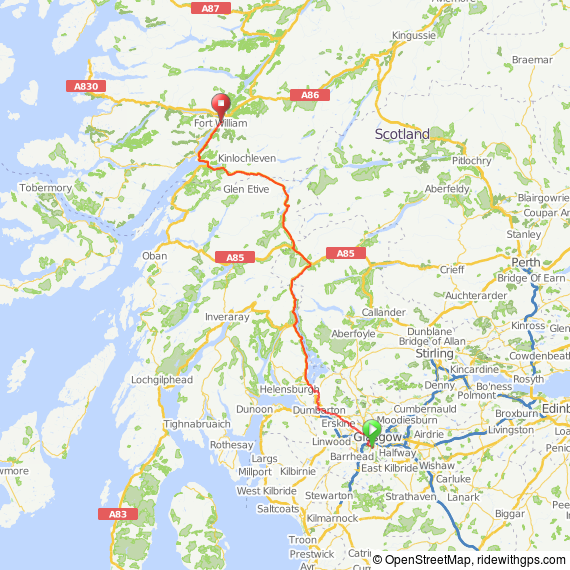 It seems people do LEJOG in Scotland one of three ways. Either you go way out west and hop over the water between places to avoid major roads, you go via Edinburgh and through the Cairngorns or you go via Glasgow and use the busy A82 but get to go through Glencoe and Loch Ness. I think I’m biased. This was one of my favourite days even with the road. Since you’re getting a bit more remote up here I can recommend stopping for lunch at Tyndrum at “The Real Food Cafe”. You can’t miss the sign for it on the left of the main road through Tyndrum. If you don’t stop here it’s a long desolate push to Glencoe before you come across anywhere else to eat. Watch the cross wind across Rannoch Moor too – it can take you by surprise. Once at Fort William I stayed at the second of my hostels – Fort William Backpackers. A secure(ish) shed for the bike and the comfiest bed of the trip. I did share with 5 other people and the room was full this time but I slept so well it didn’t bother me. It was mega cheap at £17.50 and they do an overnight wash for you if you need to. You can also hire a towel for £1. I’d learnt from my experience in Keswick of breakfast and took with me a sachet of porridge so I was happy in the morning, however this hostel had a breakfast option if you were willing to pay. It looked good but I was happy with my porridge.